The Delta Kayaks 12AR (Adventure Rec) kayak has a fusion hull design that offers effortless glide, precise handling and exceptional stability. The 12AR features a large recreational cockpit with premium outfitting, allowing for easy entry and all-day comfort. The Contour II Seat System provides excellent back support at multi-positions with quick adjustment and optimal comfort in a user-friendly design. Large, accessible front and rear hatches make loading and unloading your gear easy. Dual density bow and stern grab handles are ergonomic and easy on the hands. And the Press-Lock Hatch System hard-shell covers provide a secure seal with easy on and off convenience. 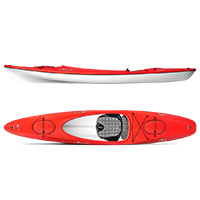 If you would like this kayak shipped to you please call us for a freight quote 1-800-832-4226. 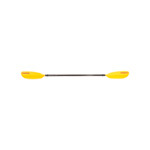 All Delta Kayaks are manufactured using the highest quality materials and Solarkote acrylic capstock is no exception. 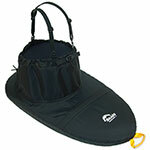 The performance features of Solarkote make it the material of choice for our kayaks. Vibrant color and gloss, long-lasting appearance with virtually no color fade, scratch resistance and excellent UV protection will keep your kayak looking new for many years.